Unwind at Come Home to Bali yoga retreat. In the restorative tropical surrounds of Ubud, Despina Meris finds serenity, spirituality, new yoga poses – and herself. It’s after nightfall, and I stand waist-deep in a large pool of cool water, direct from the mountain springs. Wrapped in the olive green sarong gifted to me by my host, I wade toward the 12 springs each representing varying elements of life: health, family, love and so on. My hands are brought together in prayer, I raise them to my forehead (representing the third eye) and allow the spring water to pour over me. I then submerge myself into the pool. Tirta Empul is considered to be the holiest place in Bali. 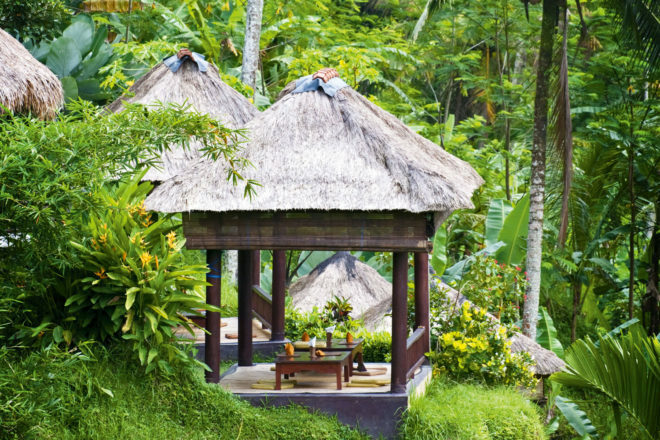 The Balinese hold pilgrimages to these sacred springs to cleanse themselves spiritually. There are Balinese here tonight in various stages of prayer, dressed in ceremonial attire. This is the first night of my Come Home to Bali retreat and already I am faced with the opportunity to shed the old and start afresh. When I booked this retreat I was stressed, overwhelmed and in need of some time out. This trip is already set to be much more profound than that. The monk’s chanting is otherworldly, hauntingly deep and primal, rising up from deep within his core. I feel the vibration of his mantras pass right through me, connecting with me on an energetic level. ‘Om’ is all that I understand, but I gather that the earthly meaning of the words is not important. I am a spiritual person at heart, but the busyness of life has resulted in me becoming hyper-focused on the tangible, like watching my life under a magnifying glass. But here I’m being reminded that there are higher energies at play; my spirituality has been awakened again. For weeks before I left home to travel to Bali there had been a tightness in my heart, and tonight, for the first time, I recognise it as fear. Certain things in my life aren’t going to plan, but there is nothing to warrant proper fear: no threat to my health or my safety. The feeling is definitely there though: maybe it’s fear of failure, fear of not achieving perfection, fear of the unknown. My eyes well up at the thought of being free from these self-imposed restrictions. Gliding through the refreshing water on silken time-worn stones, I repeat my mantra to love myself, to free myself and to trust in the universe. In Bali, praying is an intricate process, swelling with symbolism and intention. Incense is lit to call the Gods to listen to prayer, and flowers used to symbolise the earthly manifestations of the divine. I’m guided to cleanse my hands and face with the smoke of the incense and hold flowers in my fingertips as I pray. The monk blesses me with holy water and rice grains representing prosperity. This moment is achingly beautiful. A bracelet of red, black and white string is tied around my wrist. It represents the circle of life: birth, life and death, and back to rebirth. I feel light and at peace. After a restful night’s sleep, I open the door to my villa and am engulfed by the lush tropical paradise around me, a landscape of towering palm trees, ferns and rice paddies carved into the Ubud hills. Along winding paths are stone sculptures of Hindu deities, graced with rice offerings to the Gods. One such path leads me to the open-air yoga pavilion, surrounded by vivid green jungle. The sights and sounds of nature – birds chirping, trills of the geckos, giant leaves rustling – keep us in the present moment. The Balinese are deeply in touch with nature, believing that everything has a spiritual entity – every field, every tree, every blade of grass. Jim, our instructor, has dedicated his life to yoga practice, meditation, and eastern religions. As a result, he is incredibly calm and centred. He advises us early on to let go of our egos, handy advice when it comes time for headstands. Although I’ve never done two consecutive hours of yoga, I’m surprised to find it rejuvenating rather than tiring. The first improvement is to my breathing: it starts out quite shallow and I struggle to expand my lungs. By the second day, my body becomes expansive, with oxygen travelling to my lungs, my diaphragm, my lower back. There is a shift, as if I’m letting life’s energy flow through me, rather than fighting it. Sun salutations, downward dogs, bridges and forward bends are punctuated with lessons on life. I learn to find beauty in small things: the breeze against my moist skin, the smell of moss, the glistening rain drops on the leaves. I become very present and aware. Even the taste of food is enhanced. By day three, the yoga practice has markedly improved my clarity and outlook. I feel like I am glowing from the inside, and I notice that my skin looks rosy and fresh. Challenging moves highlight my nature to force outcomes; Jim’s advice is to practise surrender here, to breathe through the posture and allow the posture to flow instead of forcing it. Control is also rooted in fear; this is obviously a common theme for me. The retreat staff is attentive, content, present and grateful – a reflection of broader Hindu beliefs. Hindus believe in karma; that each individual creates his own destiny by his thoughts, words and deeds. Every exchange that I have with them makes me want to become a better version of myself. won’t be able to do it. Given my breakthrough about living without fear, I have to give it a go. I start out wobbly and unsure, but it’s not long before I’m flying down the mountain at top speed, standing up on the pedals like I did when I was a kid. We ride past palm trees, rice paddies and cacao plants. In the villages, women dry rice in the sun, men carve wooden sculptures and giddy children high-five us as we ride by. I feel exhilarated, completely free and capable of achieving anything. By the time we set off on an excursion to practise yoga at Batur Volcano, I have clarity. Every time I come up from a pose, the view has changed. Clear and sunny fades to mysterious fog, the volcano appears and disappears: a metaphor for the transience of life. So, what is my lesson to learn? Life is full of the unexpected and instead of trying to control every outcome I should welcome the unknown and stop living in fear. I can choose to embrace life, throw myself into it head-on and keep my sense of adventure alive. As the saying goes, sometimes you can’t see the forest for the trees. Retreats are a chance to take a step back and see the bigger picture more clearly. For anyone seeking to re-engage with their life’s purpose and stamp out self-limiting beliefs, a retreat isn’t a luxury, but a necessity. Jetstar have daily flights from Sydney, Melbourne, Adelaide, Perth and Darwin to Denpasar, Bali. Flights from Brisbane depart four times a week. Ubud is a one-hour drive from the airport. Come Home to Bali yoga retreat is from $1627 for a single, $1339 twin share.